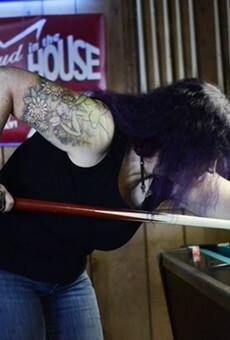 Can you ever get a pool table at your favorite bar—which has, like, maybe two? Probably not, unless you’re a billiards bully. Clicks has freakin’ 20 pool tables, mostly your standard (but quality) 8-foot-long models, but there are also three famous 9-footers—and no warped cues. If you want entertainment variety, you’ve got it—foosball, dartboards, TVs, Golden Tee LIVE (the golf arcade-game, if you didn’t know) and bowling. Want food? Clicks has popcorn, Sausage Deli sandwiches, Blackjack Pizza and more. Finally … we know you want booze—and Clicks has a full bar with raved-about beer and cocktails, which you can sip while sitting on a smoking patio, watching other pool players do their thing. What more can we say? It all just clicks.